Chef/Co-owner Jesus Rivera makes a mean plate of huevos El Salvadoreños. Tune-Up is also where the tourists go, especially the ones who watch the Food Channel, which has taken a liking to the place. The “Triple D fans” (named after “Diners, Drive-ins and Dives”) might not have the same hip-factor, but they’re just as content to be there—even if they had to park their RVs around the corner. Outside of my own kitchen, it’s rare to find eggs that are so perfectly done. The café is filled with a glow. People-friendly touches include kids’ books, good music and lighting, and a long mirror that lets wall-facing diners feel like they’re a part of the room. Meanwhile, the food manages to be a lot of things without following any one path. It’s not a burger joint, but the burgers are good. 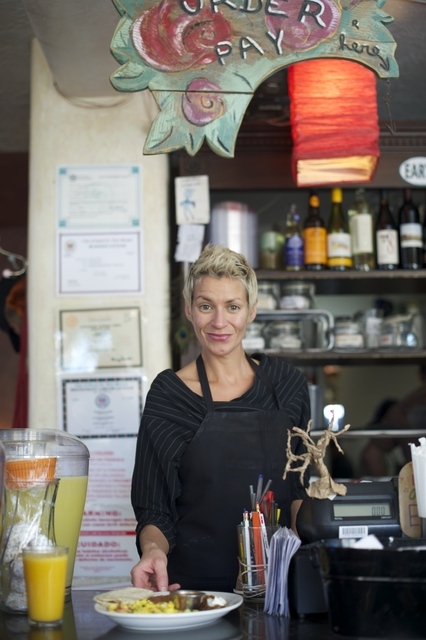 It’s not New Mexican, but Tune-Up serves chile rellenos and huevos rancheros and green chile. On paper, its most unique influence is from El Salvador, but you could eat there many times and not even notice. Huevos El Salvadoreños come with fried plantain and crema. Tune-Up’s eclectic nature is a reflection of the influences behind it. Occupying the same Hickox adobe that used to house popular neighborhood restaurant Dave’s Not Here, the café is a crossroads of the Santa Fe dining scene. 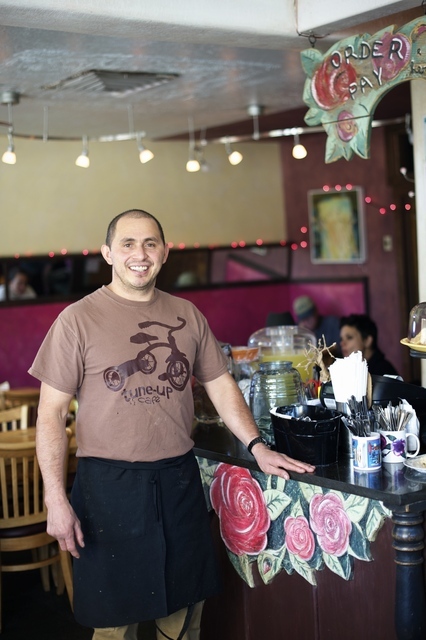 The chef and co-owner, Jesus Rivera, was a longtime cook at Café Pasqual’s. He and his business and life partner, pastry chef Charlotte Rivera, bounced around the Santa Fe restaurant scene for years before they started Tune-Up together. This place is an embodiment of their histories and techniques. There are shades of Pasqual’s Latin funkiness in the decor and dishes. Charlotte’s native Louisiana shines through—in a swampy, voodoo way—via the dark wood and bright spirit. There are relatives in the kitchen from Jesus’ home country, El Salvador. Dishes like the Salvadoran tamale (wrapped in banana leaf) and pupusas share rarefied New Mexico air with Albuquerque’s Pupuseria y Restaurant Salvadoreño. The huevos El Salvadoreños I ordered were a moist, fluffy pile of scrambled eggs with tomatoes and green onions. Outside of my own kitchen, it’s rare to find eggs that are so perfectly done. The eggs came with fried plantain, refried beans, crema, corn tortillas and some pronounced cumin. Consider ordering a side of meat with this one. The café’s ingredients are procured with care, although the Tune-Up burger is carelessly labeled “local (no rBGH, no antibiotic).” Recombinant Bovine Growth Hormone (that is, rBGH) is a genetically engineered hormone designed to boost milk production. It’s not typically given to beef cows. The only exception is when someone makes meat out of spent dairy cows. ... Anyway, it came with garlic mayo, so I ordered it. Great burger. A New York strip on the specials board, advertised as local and organic, was an absolutely amazing steak. I ordered it slightly more rare than I wanted, and it came out perfect, drenched in an herbed Zinfandel-shallot sauce that bridged the juicy steak and a side of garlic mashed potatoes. I would eat an old milk cow with that sauce. The Tune-Up Café is an ace in the hole for Santa Fe restaurant recommendations, especially if you’re planning a meal for picky eaters. With so much variety on the menu and skill in the kitchen, most anyone would be happy here. Except, perhaps, that fur coat in the BMW by the Plaza.